It's always been my ambition to get my various blogs integrated properly with their relevent photographic website. And whilst I've enjoyed the blog being hosted with Blogger for the past six months, now I've finally managed to get everything set up properly on my general photography website. The main site lives at cazphoto.co.uk and you can now find this blog migrated to the site too, with a properly integrated version of WordPress and a lovely new style to match the rest of the site. I shall be leaving this site here as a permanent record, but all new posts will now appear at the other site. I hope you follow me there! 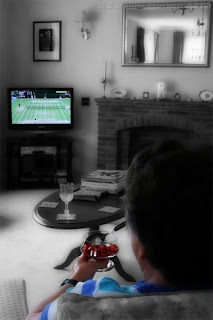 Notes: Mum is an avid tennis fan, and she’s glued to the box during Wimbledon fortnight. I visited for lunch today, and there’s no prizes for guessing where she was camped out after we had eaten. The Men’s Final was quite a Marathon, and was, of course, accompanied by the obligatory strawberries. At least we didn’t have to don our macs during the interruptions for rain! Notes: Despite dire predictions for today’s weather, it was actually a lovely day. The big fluffy clouds, against the blue sky would make a perfect backdrop for a picture of Mountnessing Windmill, so that’s where I visited around lunchtime. 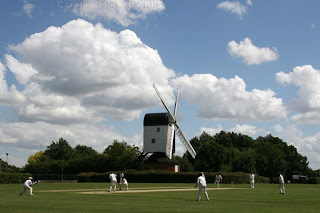 I took a few pictures just of the mill, and then noticed they were gearing up for a cricket match. I haven’t photographed cricket for ages, so I hung around for a while at the boundary and took some action shots, as well as this wider setting. Notes: Exploring the fields around Ingatestone for today’s picture, I liked the way this ear of corn did its own thing, and really stood out from its neighbours. Notes: I deliberately left it late for today’s picture as I wanted to revisit the location of Day #64’s image, which faces west. Despite taking quite a few ordinary sunset pictures there, I wasn’t really very enamoured with any of them when I got home. 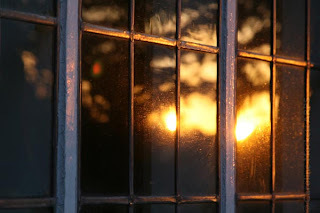 I much preferred this view of the sunset reflected in a window of Buttsbury Church. It reminded me of some of fellow 366 Flickerite touchingthelight’s images. Notes: For the most part, it was another grey, miserable day. So I stayed indoors and nursed my poor, bruised knees. However, by about 8pm, there was a chink of light coming through the clouds, and I decided to go to the Common for a hobble round. I got a few fairly mundane shots in the woods and grasslands, and then returned to my favourite spot overlooking the Wid Valley to watch the sunset. 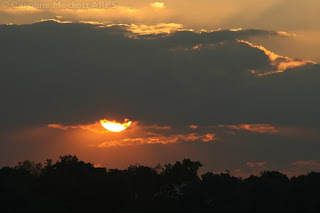 I was rewarded with a great Red Sky At Night just over Hylands House, which is lurking in the shadows at the bottom. 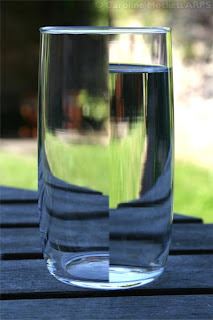 Title: Half Full Or Half Empty? Notes: This week’s 366 theme is “a phrase or saying” - so here we have, The Glass Is Half Full/Half Empty. At the moment, I would have to say it’s half empty. I’ve been having a bad week generally, and just when you think it can’t get any worse… This evening, shortly after I’d taken this, I managed to trip over in the garden. So now I have two sore knees, a slightly fat lip, scratched glasses and a bruised ego. Wonderful. On a slightly more positive note, at least we’ve made it to Half Way today - day 183/366. Congrats to all who have come this far too. 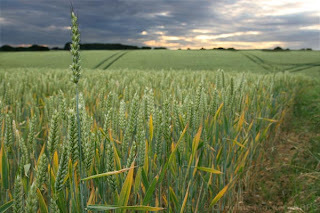 I'm aiming to take a minimum of one photo each day during 2008 and post it to remind me of my year. You can read the full explanation here. You can select a day from the list of Archives below the About Me section, or see a calendar view at my other website.